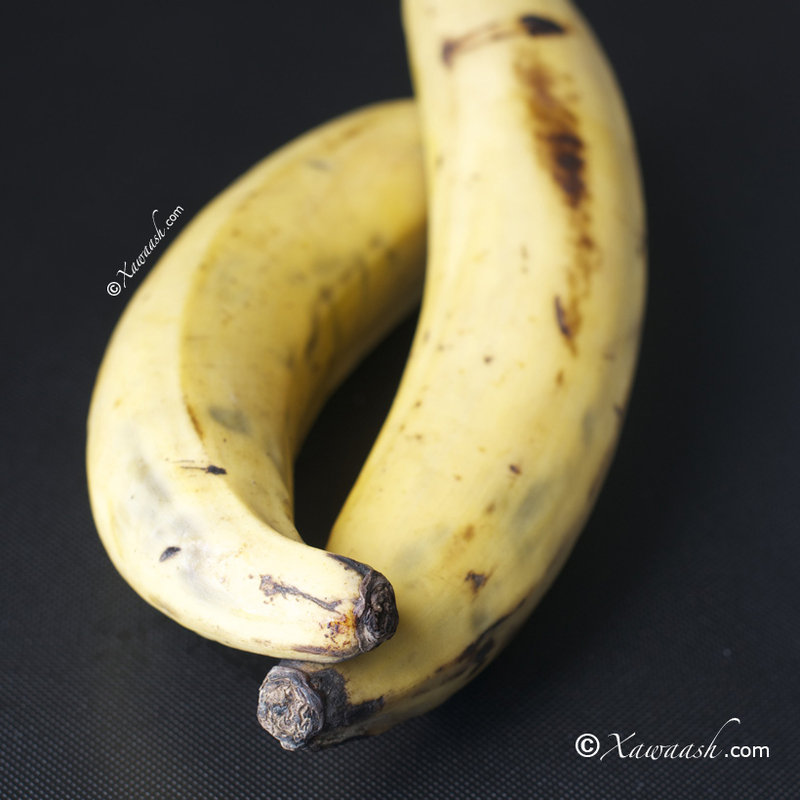 If you have never had a plantain, it tastes pretty much like a potato when a raw or semi-ripe plantain is cooked. We prepared this stew for some guests and they all thought they were eating potatoes. Plantains are a staple food in southern Somalia and are added to both savoury and sweet dishes. 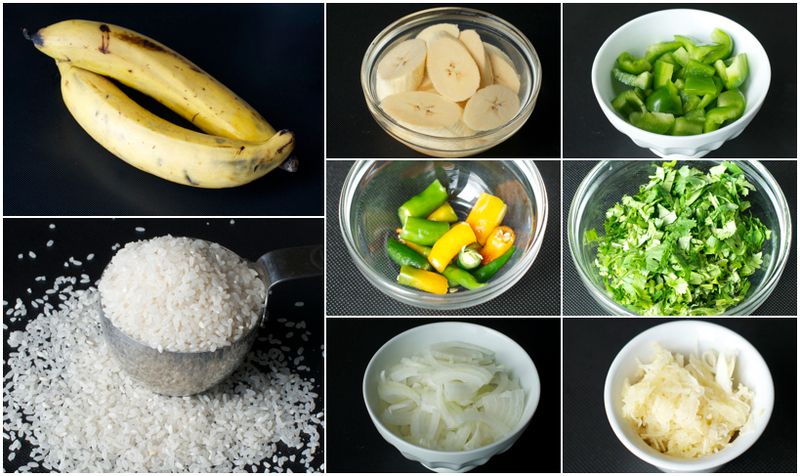 In this post, we show two different methods of cooking plantains. 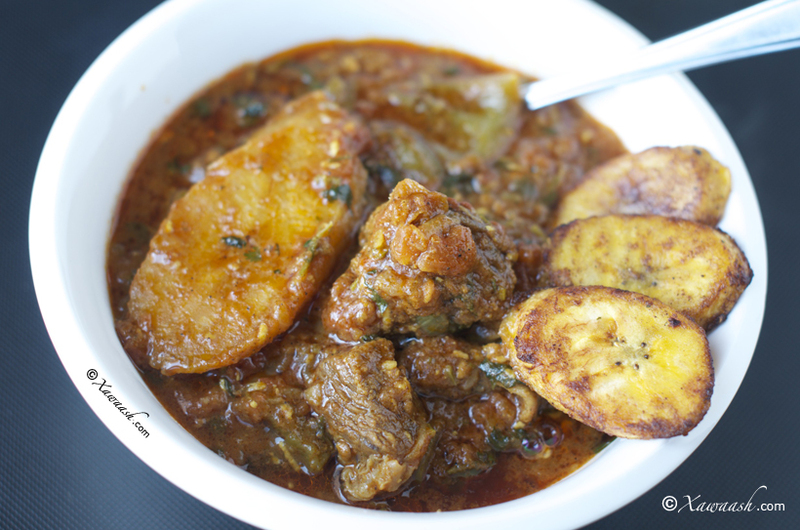 For the stew, we used a semi-ripe plantain which is much easier to peel than a green one and takes much less time to cook. 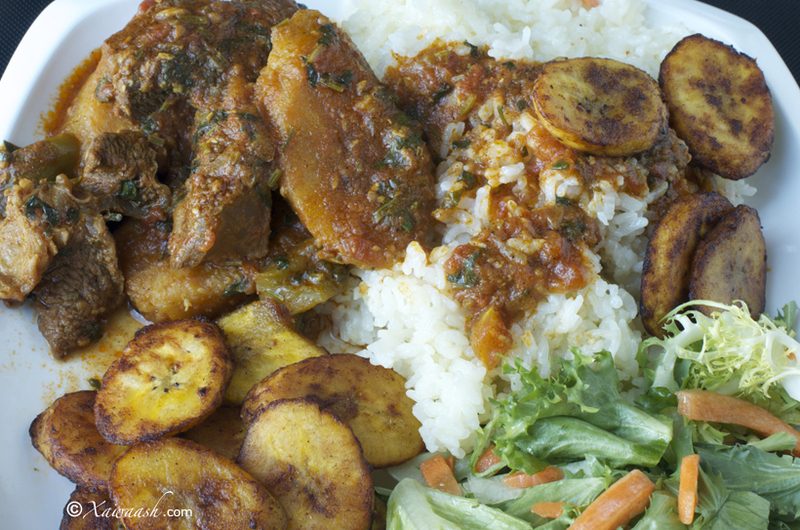 It is not recommended to use very ripe plantains in stews as they will easily disintegrate and will also make the stew taste too sweet. 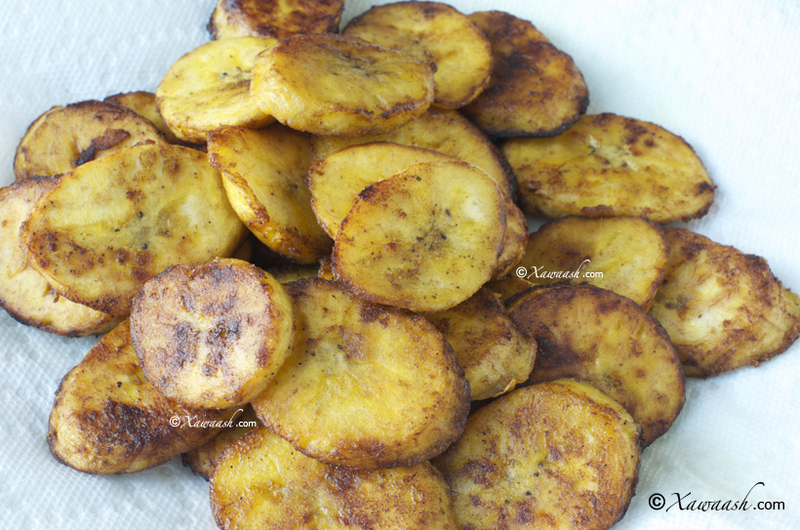 For the fried plantains, we used ripe fruit that we sliced thinner. You could use semi-ripe plantains but when you fry them, they will taste like french fries. 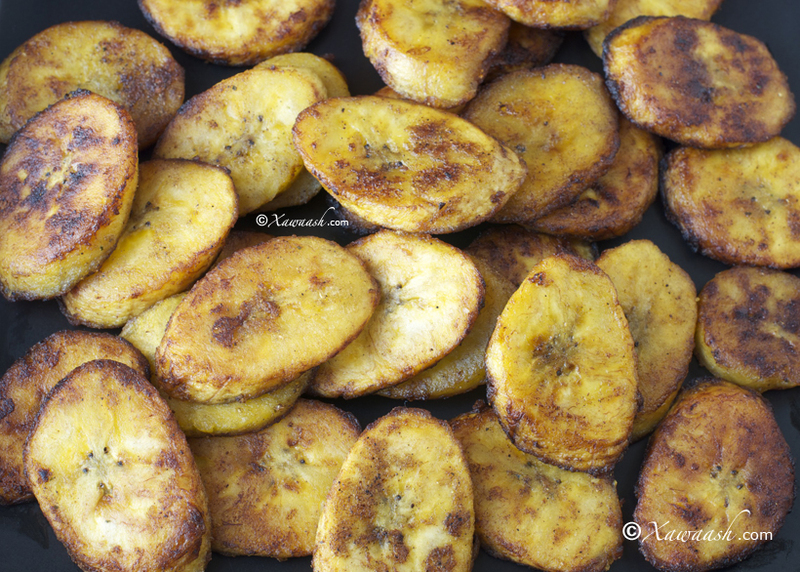 When you fry very ripe plantains, they taste almost like fried bananas. For most Somalis, this would be the perfect accompaniment to rice. It is a delightful combination of sweet and savoury. 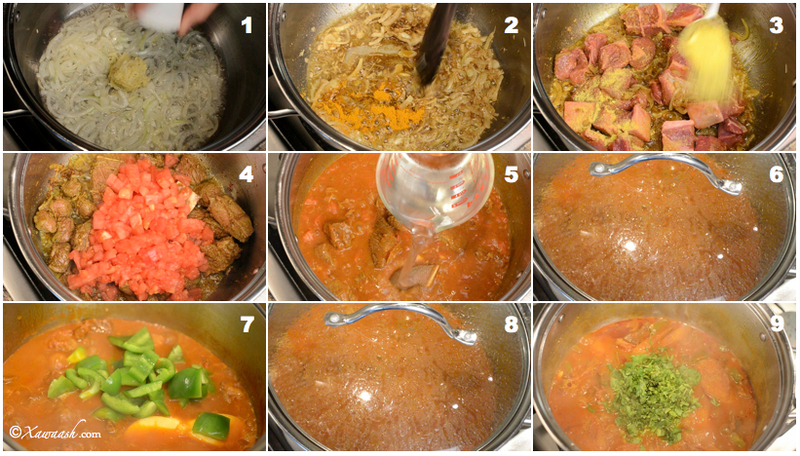 Enjoy this traditional and delicious Somali stew. Si vous n’avez jamais goûté de plantain, un plantain vert ou à moitié mûr aura un goût de pomme de terre une fois cuit. Nous avons préparé ce ragoût pour des invités et ils ont tous pensé qu’ils mangeaient des pommes de terre. Les plantains sont un aliment de base dans le Sud de la Somalie et sont utilisés dans les plats aussi bien salés que sucrés. Dans cette recette, nous vous montrons deux méthodes différentes de cuisson des plantains. Pour le ragoût, nous avons utilisé un plantain à moitié mûr qui est beaucoup plus facile à peler qu’un plantain vert et nécessite beaucoup moins de cuisson. Il est déconseillé d’utiliser des plantains trop mûrs en ragoûts car ils se désintégreront et ils rendront le plat trop sucré. Pour les plantains frits, nous avons utilisé un fruit mûr que nous avons tranché fin. Vous pouvez utiliser des plantains à moitié mûr mais quand vous les aurez frits, ils auront le même goût que des frites. Lorsque vous faites frire des plantains très mûrs, ils ont presque le même goût que des bananes frites. 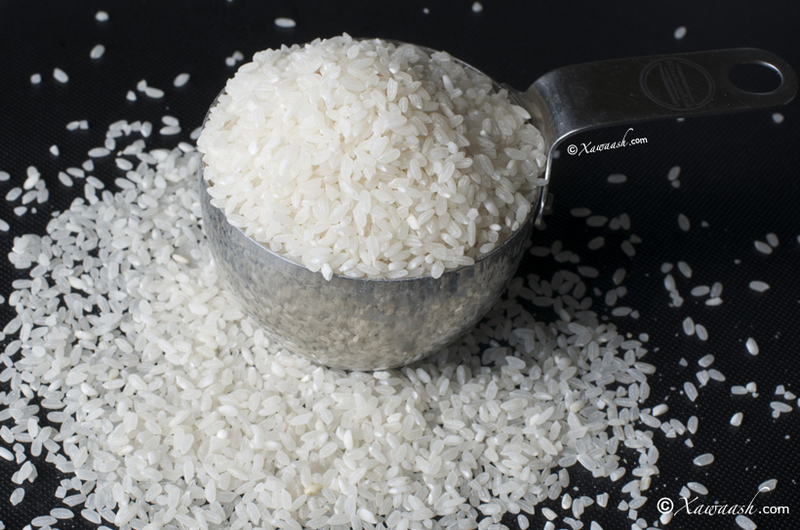 Pour la plupart des Somalis, ils sont l’accompagnement parfait du riz. C’est une combinaison délicieuse de sucré-salé. Régalez-vous avec ce délicieux ragoût traditionnel Somali. 1. Using medium heat, fry the onions in the oil for 3 minutes, then add the garlic. 2. Add the Xawaash spice mix and turmeric powder. 3. Add the beef, the Vegeta seasoning and the ground black pepper. Cook for 4 minutes before adding the tomatoes. 4. Add the green chilli, if using. Add the tomatoes. 5. Add the hot water. 6. Cover and cook on medium heat for ½ hour. 7. Add the sliced plantain and the chopped green pepper. 8. Cover and cook on medium heat for another ½ hour. 9. Add the chopped coriander. It is ready to serve with rice (see recipe below), grits, anjero, or sabaayad. 1. Basasha dallac muddo 3 daqiiqo, kaddibna tuunta ku-dar. Hal daqiiqo isku-shiil. 2. Xawaashka iyo huruudda ku-dar. 3. Hilibka ku-rid digsiga. Maraq qudaarta Vegeta iyo filfisha shiidan ku-dar. Afar daqiiqo kari intaadan yaanyada ku-darin. 4. Basbaas cagaarka ku-dar (waa ka-dhaafi kartaa). Yaanyada ku-dar. 5. Biyaha kulul ku-dar. 6. Dabool oo dab dhexdhexaad ah ku-kari muddo ½ saac ah. 7. Moos bukiiniga iyo barbarooniga cagaaran ku-dar. 8. Dabool oo dab dhexdhexaad ah ku-kari muddo ½ saac ah. 9. Kabsaro caleenta jarjaran ku-dar oo dabka ka-dhemi. Waxaad ku-cuni kartaa bariis (soo’da hoos ayay ku-qoran tahay), soor, canjeero, ama sabaayad. 1. Frire les oignons dans l’huile 3 minutes à feu moyen, puis ajouter l’ail. 2. 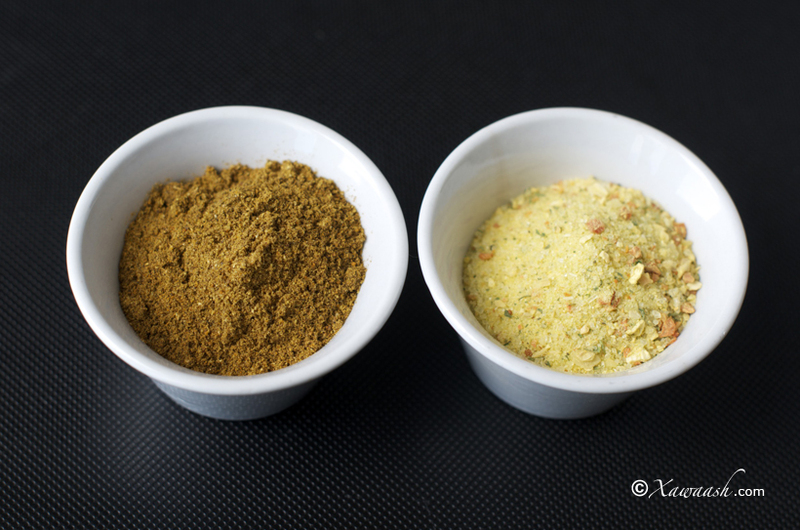 Ajouter le mélange d’épices Xawaash et la poudre de curcuma. 3. Ajouter le boeuf, le condiment Vegeta et le poivre noir moulu. Cuire 4 minutes avant d’ajouter les tomates. 4. Ajouter les piments si vous en utilisez. Ajouter les tomates. 5. Ajouter l’eau chaude. 6. Couvrir et cuire à feu moyen pendant ½ heure. 7. Ajouter le plantain tranché et le poivron vert découpé. 8. Couvrir et cuire à feu moyen 30 minutes de plus 9. Ajouter le coriandre haché. Le plat est prêt à être servi avec du riz (voir la recette ci-dessous), de la bouillie de maïs, anjero, ou sabaayad. 1. Wash the rice 3 times but do not soak. 2. Bring the water to a boil, then add the Vegeta seasoning. 3. Add the olive oil and mix well. 4. Add the rice. 5. When it comes to a boil, mix very well. 6. Cover and cook for 13 minutes using the lowest setting on your stove. 1. Bariiska 3 goor dhaq laakiin biyo hala-dhigin. 2. Markay biyaha karkaraan, ku-dar maraq qudaarta Vegeta. 3. Ku-dar saliidda oliifada, kaddibna si-fiican u-walaaq. 4. Bariiska ku-shub. 5. Marka uu soo karo, si-fiican u-walaaq. 6. Dabool oo dabka ugu gaaban ku-kari muddo 13 daqiiqo. 1. Laver le riz 3 fois sans le laisser tremper. 2. Faire bouillir l’eau, puis ajouter le condiment Vegeta. 3. Ajouter l’huile d’olive et bien mélanger. 4. Ajouter le riz. 5. Dès que l’ébullition reprend, bien touiller. 6. Couvrir et cuire 13 minutes au feu le plus bas possible. 1. Peel the ripe plantains. 2. Cut on a bias into ½” or 1¼ cm thickness. 3. The sliced plantains. 4. Add the Xawaash spice mix and the Vegeta seasoning. Coat well. 5. Using medium heat, fry the plantains in the oil. Fry for 2 minutes on the first side then flip over. 6. Fry for 1½ minutes on the second side. Drain on paper towels. 1. Moos bukiiniga fiiq. 2. U-jar gaballo buurnidooda tahay ½” ama 1¼ cm. 3. Moos bukiiniga oo jarjaran. 4. Ku-dar Xawaashka iyo maraq qudaarta Vegeta. Si-fiican u-wada mari. 5. Dab dhexdhexaad ah ku-shiil. Dhinaca koowaad 2 daqiiqo shiil, kaddibna dhanka kale u-rog. 6. Dhinaca labaad 1½ daqiiqo shiil. Xaanshiyaha jikada (paper towels) saliidda uga saar. 1. Peler les plantains mûrs. 2. Couper en biais des morceaux d’ ½ pouce ou 1,2 cm d’épaisseur. 3. Les plantains coupés. 4. Ajouter le Xawaash et le condiment Vegeta. Bien recouvrir. 5. Frire les plantains dans l’huile à feu moyen. Frire 2 minutes d’un côté puis retourner. 6. Frire 1½ minute de l’autre côté. Égoutter sur du papier absorbant. 32 Comments - Leave a comment! Muus bukiini ayuu ku-fiican yahay. Muuska caadiga oo aad cayriin u-ah ama cagaaran waad isticmaali kartaa, laakiinse dhadhanka isku mid ma ahan. Muus bukiini sida bataatada ayuu u-dhadhamaa. Mahadsanid. Waa muus ka duwan muuska la cuno, waddankeenana waa laga helaa. Moos Bukini all the way. My yaya(ayeyo) loves moos bukini. she makes the sweat kind though. Thank you for posting this. Hopefully we will post the sweet version too. Thank you for taking the time to comment. Aad iyo aad ayaa u-mahadsan tahay. Walaal qaali ah ayaad tahay. Waan ku-faraxnaa faallooyinkaada iyo ducooyinka fiican. Jazaakillaah khayr wa baaraka fiiki. asc, masha’alaah aad ayd u mahadsan tihiin walalayaal kheyr badan allaha idinsiiyo, inaga reer muqdisho hadii an nahay a lot of resources (vegetables and fruits) ayn heysanaa hadana inta badan kama fa’iideysan naqaano aad ayd u mahadsan tihiin fahanka qaaliga ee aad noo abuurteen illah kheyr badan ha idinka siiyo walalayaal. Adigaa mahadda mudan walaal. Hadduu Eebbe idmo qudaar iyo furuuto kalena waan soo gelin doonnaa. Aad iyo aad ayaa ugu mahadsan tahay faalladaada. Hadduu Ilaahay yiraahdo waan soo gelin doonnaa. Mahadsanid. 1. Can I use lamb leg cubes instead of beef for this stew ? My family and I love lamb. 2. 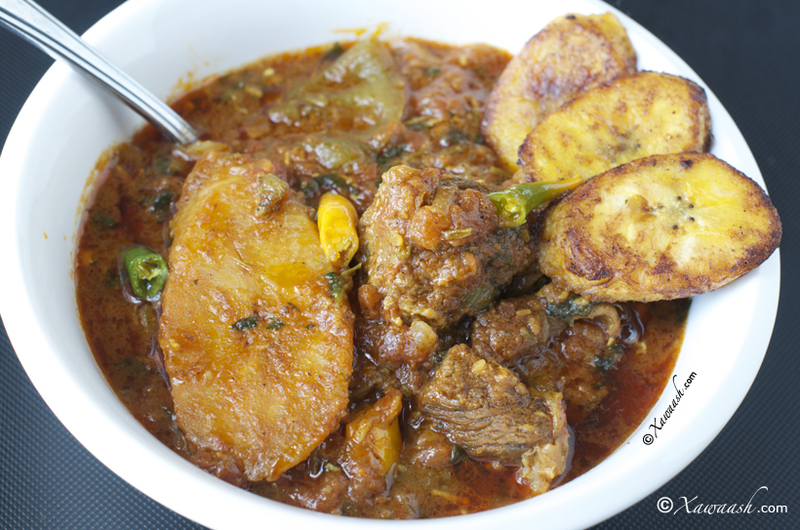 If I cannot find plantain here, can I just use one semi-ripe banana in this stew ? Thank you very much for your sharing. I really love your website. A few days ago I tried to make Yoghurt Coconut Chicken again. This time, as you pointed out in my previous post, I cooked on medium heat and it did not burn my pot. Thanks so much. My family likes this dish very much. Yes, Celmah, you can use cubed leg of lamb. 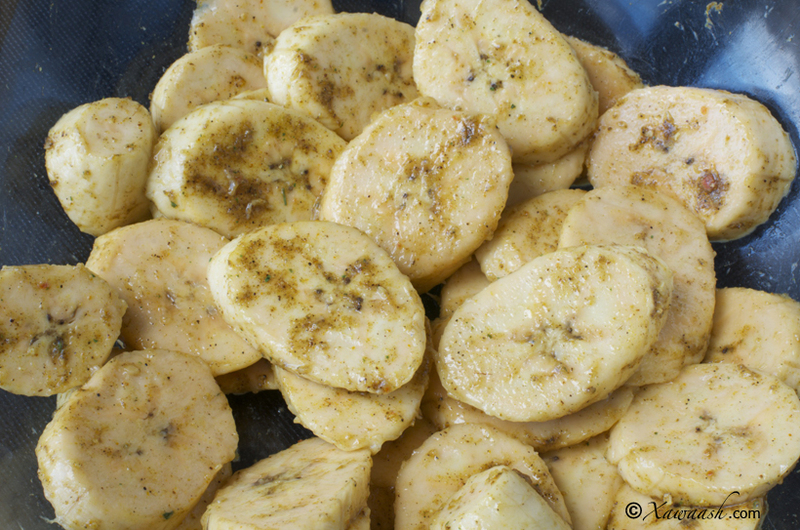 You can also use potatoes if you cannot find plantains or green bananas (cannot be peeled without a knife). Do not use semi-ripe bananas. Use ground cumin and/or coriander instead of xawaash. Thank for your comment and questions. Thank you but can i ask if you mean fresh coriander orground coriander seed ? I got both in the kitchen. Also what is the quantity for ground cumin and coriander ? Thanks so much. I will try this recipe this weekend. We mean coriander and/or cumin seeds (ground). You can use 1/2 a tablespoon coriander and 1/2 a tablespoon cumin. You are most welcome. We are happy you liked it. Thanks for the comment. 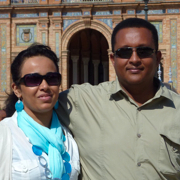 REER Oslo Waa ku ladnaanay xawaash.com. Waxtar wayn uu uleeyahay ummada iskaabulada oo dhan..
Adigaa mahadda mudan walaal. Waan ku-faraxsan nahay inuu waxtar idiin leeyahay oo aad ka-faa’iidaysanaysiin. Waa ku-mahadsan tahay inaad nala socodsiisay. In a world full of food complications, you make cooking so simple. I’ve tried out most of your food and my family loves it. I’ll be trying this one out for tomorrows dinner,Wish me well. The plantains look great. can’t wait to taste. Thanx for sharing your recipes with us. Thank you for boosting our energy level with your great comment. We wish you good luck with the recipe. Have fun with it. ha idin dayo halka ka si wada . Waa ku-mahadsan tahay hadalada wacan iyo ducada wanaagsan. Waxaan kuu rajaynaynaa qayr iyo farxad. Aad iyo aad ayaa ugu mahadsan tahay faallada iyo dhiira gelinta. Hadduu Eebbe idmo waxaan ku-tala jirnaa inaan sameyno e-book. Ilaahay waxaan kaaga baryaynaa qayr badan oo aan dhammaan. Mahadsanid. asallamu calaykum walaalayaal, waad ku mahadsantihiin cinwaanadaan faaidada leh oo aan dareemi karo waqtiga iyo kharajka aad galiseen, alxamdulilaah fursad ayey ii tahay inaan arko markii iigu horeysay web cuntada somaliga ka faaloonayo, markale waad mahadsantihiin wlaalayaal. Adigaa mahadda mudan walaal. Waan ku-faraxnay hadalada wacan iyo faallada fiican. Waxaan rajaynaynaa inaad ka-faa’iidaysatid Xawaash. Aad iyo aad ayaa u-mahadsan tahay. This is a great recipe! I have a request, can you all add a recipe for maraq that goes with white rice? 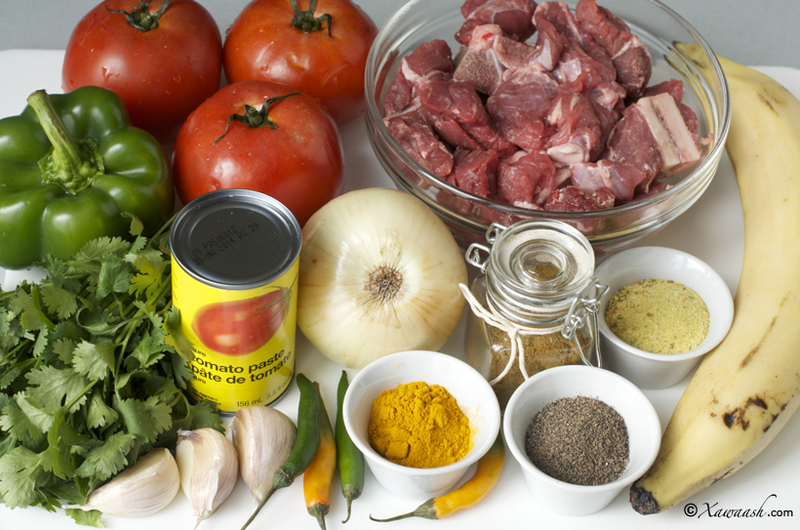 How did you know that our next recipe is Maraq (stew) that is great with white rice. We will try to find the spy who let out the secret. ASC. Waad mahad santihiin sida wanaagsan oo aad nooga haqab tirteen karinta cuntada. Moosbukeeni caanaha qunbaha&subag iyo sokor lagukariyo unbaan aqiinay,waan idinka faa’iidnay A&L. XAWAASH waxbadan ayuu kabedelay cuntoo yinka laga cuno guryaha SOOMAALIYEED.Jisaakumallaah. Adigaa mahadda mudan walaal. Waan ku faraxnay inaad jeclaatay. Aad iyo aad ayaa ugu mahadsan tahay faallada wacan.